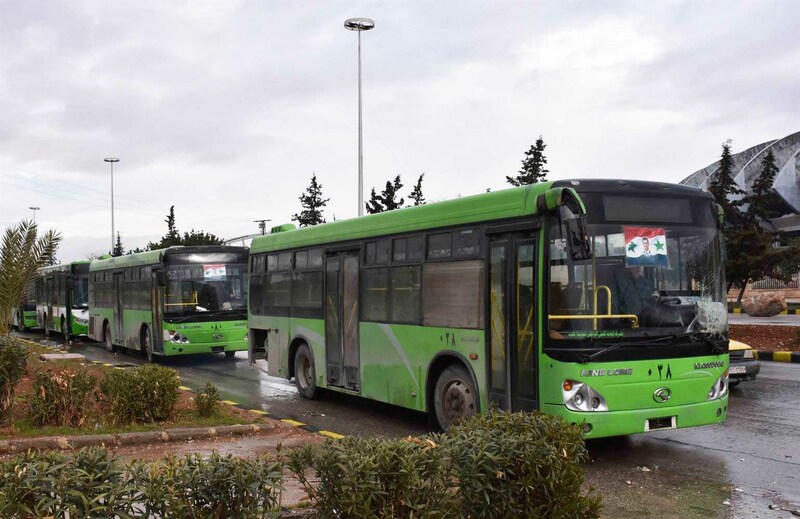 The battle against Islamists in eastern Aleppo is nearly over, as another 2,000 jihadists have boarded 60 government buses and are on the way to Idlib under the supervision of Red Crescent and UN. According to Red Crescent officials 34,000 people have been evacuated. 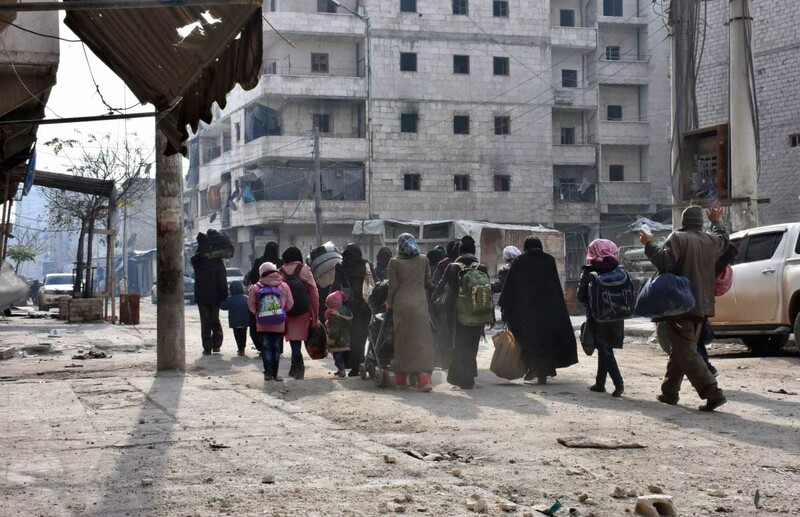 The evacuations — which included the evacuation of civilians besieged for 20 months in the Idlib Shia enclave of Faoua and Kafraya in exchange for the remaining Aleppo Islamists — were organized between Russia and Turkey. 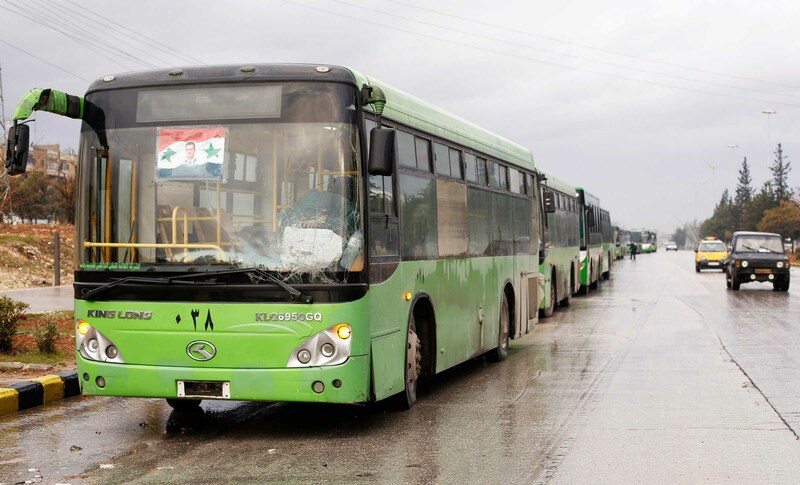 There was serious sabotage of this agreement by Islamist gangs, who burned evacuation buses and killed at least one driver, it is a miracle that the evacuation nevertheless can be conducted in an orderly way. Temperatures around freezing with sleet and snow surely helps focusing the parties on completing the process. Before leaving for good, the remaining militants in the al-Mashhad and al-Sukkari district lit up two weapons and ammunition depots, resulting in powerful explosions which were heard in the whole city. Rebel sources still claim that some jihadists have not left but choose fighting to the death. It will come out in the next few hours if this is true. 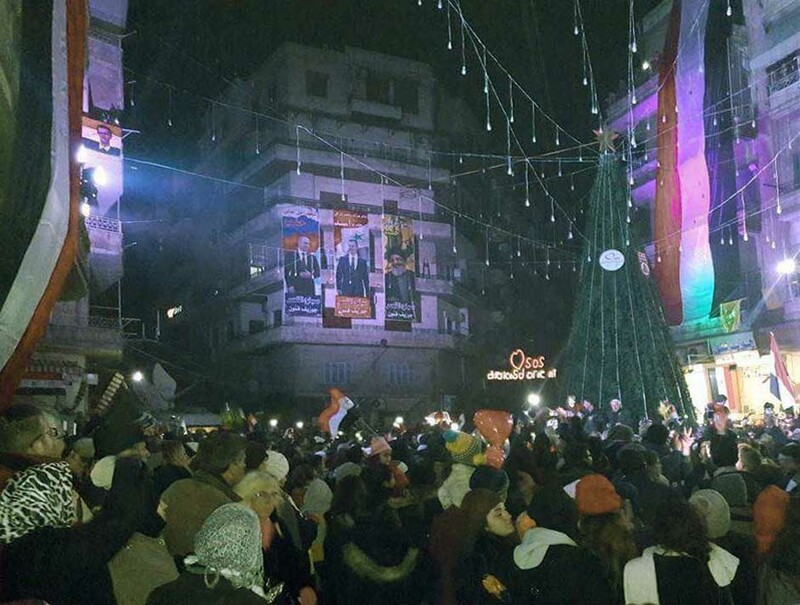 In western Aleppo there is elation and dancing in the streets, shown widely on social media, while Western news organizations solemnly reported about “the fall of Aleppo”. In contrast, the nearly simultaneous capture of Syria’s ancient city of Palmyra by IS (Islamic State) was reported with barely concealed delight and schadenfreude. Russian sappers are already working in eastern Aleppo to defuse thousands of IEDs (improvised explosive devices) and mines laid by the jihadists, while electricity and water supplies have been resumed in several districts. A total of 3,406 militants surrendered during the government offensive, and over 3,000 of them were pardoned. Western nations have pledged to send desperately needed humanitarian aid, but it will only go to Islamist territory. Aleppo will see nothing of this. Help for the needy Aleppans is now considered the sole responsibility of Russia and allies (China, Belarus, Armenia, Cuba, Algeria, and others). The jihadists will do everything to prevent humanitarian relief, they already shelled a Russian field hospital, killing two paramedics. Western newscasters and commentators are out of their minds, deeply disturbed and embarrassed by the defeat of their jihadi heroes. The steady stream of reports about alleged atrocities has become a deluge and the used language can only be described as “hate speech”. Following the last headline is this text: The faces of the besieged stare into the camera, at us and at death, pleading for help, describing the atrocities outside their bedrooms or just on the other side of the door. They are baffled by our indifference to the slaughter. This is nearly poetic, this is a good start for a horror tale. This is fiction, not journalism (it has to be fiction because there was no Western camera team in eastern Aleppo, as news people feared to get kidnapped by the Islamists). The narrative is the same each time: That an all-out genocide is taking place; that Assad forces are going from city to city killing civilians and taking no prisoners; that Aleppo’s rebels valiantly look death in the face as they endure alleged Russian bombardment. Western journalists have no mercy and no pity. After the murder of Russian Ambassador Andrei Karlov in Ankara, a New York Daily News article with the headline “Assassination of Russian Ambassador Andrei Karlov was not terrorism, but retribution for Vladimir Putin’s war crimes,” showed Western journalism at its finest. An excerpt: Andrei Karlov is the human embodiment of policies that deployed bunker busters to kill babies, sent fighter planes on scorched earth bombing runs that destroyed a whole city, aided Syrian madman Bashar al-Assad in his campaign that has killed hundreds of thousands, and even ordered attacks on UN aid workers. What is the purpose of this hate campaign? Is it only to justify the transfer of more and more weapons to the Islamists or is it a preparation for starting war against Russia and Iran? Independent reporters (Lizzie Phelan, Vanessa Beeley, Eva Bartlett, Rania Khaled, Sharmine Narwani) and a few dissident journalists (Robert Fisk, Patrick Cockburn) tell a different story than mainstream media workers. And this different story is, that civilians were prohibited from leaving the eastern Aleppo enclave and many were shot dead when they tried to do so. The armed jihadist gangs had hoarded food reserves but kept it for their fighters. When Syrian troops conquered the warehouses they opened them and distributed the food to locals. As Syrian forces smashed the jihadist lines, the trapped civilians streamed out towards government territory. There are many video reports about long lines of people leaving the eastern neighborhoods and finding food and shelter with the government. Tired and relieved, they told their stories to anyone who cared to listen. Russia and Iran sent tons of food, clothing, blankets, and other necessities, Western countries contributed nothing. Western countries contributed nothing except hate propaganda. If Western media workers (the term journalist is inappropriate in this case) would have just a tiny little bit of integrity and honesty, they would refuse to join the choir of smear and slander. They would also understand that their reputation is at stake, as more and more people become skeptical and look behind the curtain. Western powers raised hell on Syria, tried to destroy its economy with sanctions, fought its currency, payed billions for weapons and general supplies to extremists from over 100 countries descending on Syria, launched an unprecedented media propaganda war, organized false flag chemical gas attacks, tried everything and anything and still could not get a significant amount of Syrians to support the “revolution”. While thousands demonstrate for the government and volunteer in civil defense organizations we are still told that Dr. Bashar al-Assad is despised and has no support among Syrians. If a significant amount of the population would support the Islamists, and it would not even have to be the majority, the political system and all state institutions would collapse within weeks. 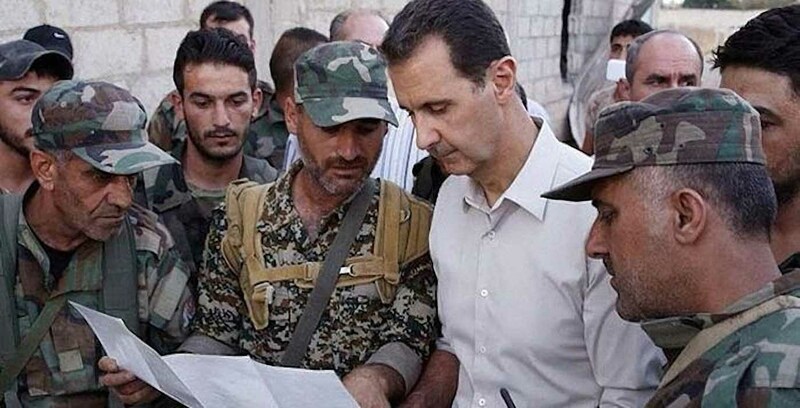 Assad is not a superman with super human abilities to resist the world outside and a solid opposition inside, no, he is kept in power by the support of the majority of Syrians, who view him as guarantor of the secular state, religious freedom, and social responsibility. This is also not a sectarian conflict, as Western pundits want the public to believe, and it is not only Christians, Shia, and Alawits, who support the Syrian government. 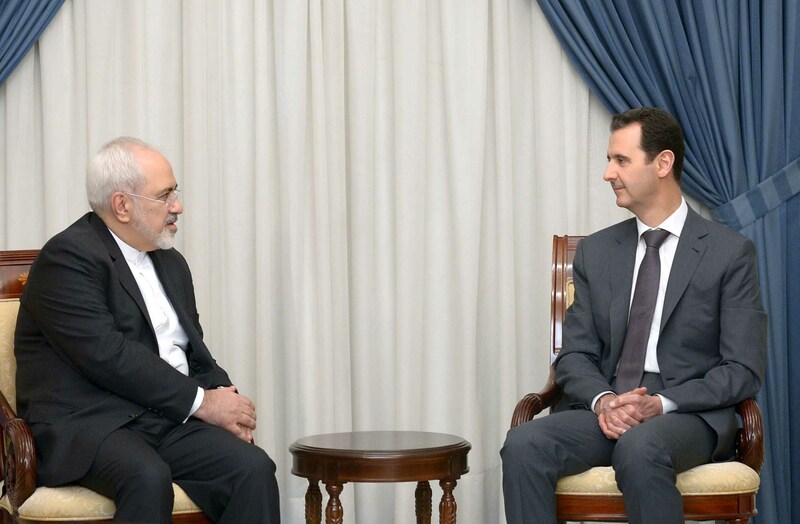 Syrian Sunnis would never support a regime that is suppressing and persecuting them. 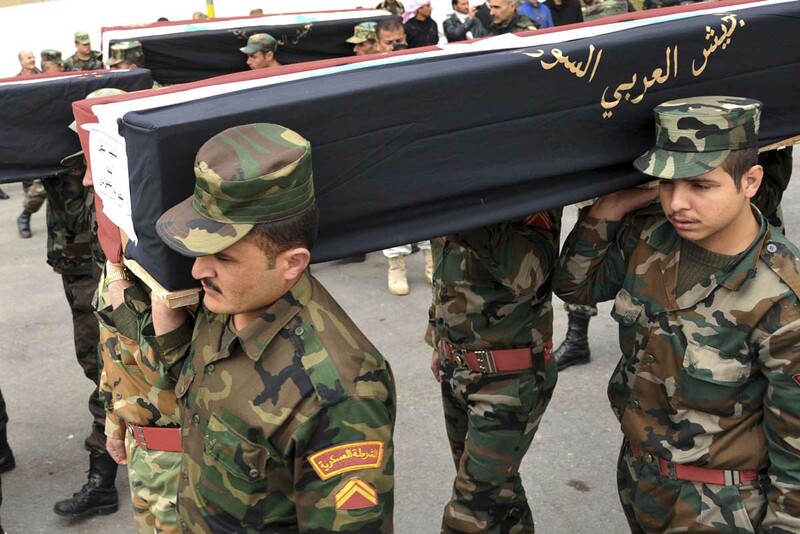 A religious war is only waged by the Sunni Islamists, many of them foreigners, while Syria’s Sunnis are the backbone of all state institutions as well as the army. Russia is engaged with Turkey and Iran in three way talks while the USA plus allies from NATO and the Gulf are sidelined at the moment and not anymore in control of the developments. It has yet to be seen which measures the West will take to regain the initiative. There are no recorded ATGM (anti-tank-guided-missile) launches since December 9 and TOW supplies of the Islamists are reportedly running low, which could be either caused by US prohibitions in an effort to weaken Jabhat Fateh al-Sham (al-Qaeda) or by a Russian — Turkish agreement. 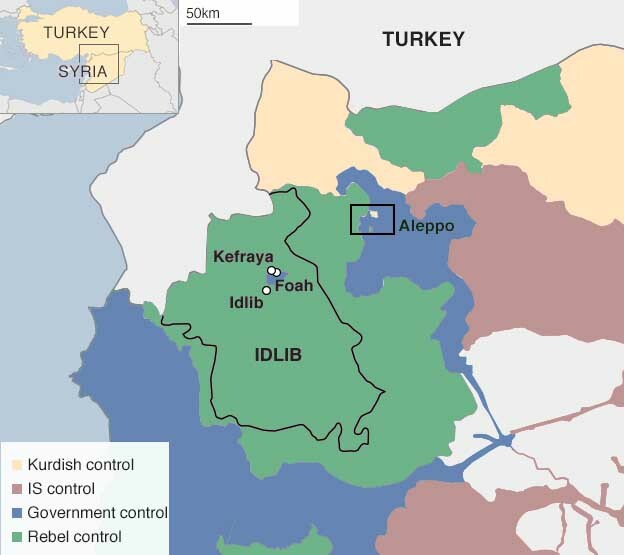 After Turkish led Islamist groups (Levant Front, Hamza Division, Fastaqim Union, Free Idlib Army, Ahrar al-Sham, Sultan Murad Brigade, and others) proved to be utterly incompetent, more Turkish troops have invaded Syria, increasing the continent to between 600 and 1,000 soldiers. There is heavy fighting between Turkish units and IS (Islamic State) in al-Bab. Turkey until now lost more than 30 soldiers and at least 12 armored vehicles (tanks, bulldozers, BMPs) in the Euphrates Shield offensive. Two captured Turkish soldiers have been burned alive by IS. 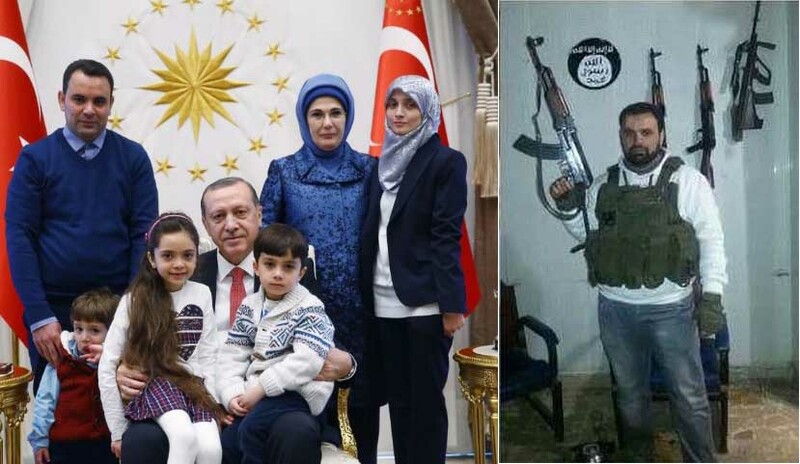 All this indicates that Erdogan’s love affair with IS and the phase of amicable IS retreats (Jarabulus, Dabiq) is over, yet, only a wave of IS terror bombings all over Turkey would be definite proof of such a development. Turkish troops had entered al-Bab and were advancing to the city center, but a counter offensive by IS, spearheaded by two SVBIEDs (suicide-vehicle-born-improvised-explosive-devices), has beaten them back to the outskirts of the town. IS is still a force to be reckoned with, while the FSA (Free Syrian Army) has definitely seized to exist. The NSA (New Syrian Army), funded, equipped, and trained by the USA, Britain, and Jordan with high hopes to take control of the border area between Syria and Iraq, drive IS out from al-Bukamal, and become a shining example of the mythical “moderate rebels,” has been dissolved. Long truck convoys of the IHH (Humanitarian Relief Foundation) are waiting in Turkey to cross into Syria and it is rumored that they are not only transporting humanitarian aid but also tons of weapons to resupply the jihadists. There are also rumors of a new multiple fronts offensive with which the Islamists hope to reverse the Syrian army’s gains. They probably will attack Khanaser, because its one of the few truly precarious but also strategically vital points in all of Syria. It is the perfect place to launch a real or diversionary attack to tie up army resources or even conquer new territory by surprising unexperienced NDF (National Defense Forces) units. Northern Hama is another vulnerable front. The army still has not regained all territory which Islamists took earlier in the year, so the fighters on that front are likely better motivated than those still reeling from the defeat in Aleppo. A multiple pronged attack concentrated around Hama and Homs with a small force attacking the strategic supply line of Khanasir to slow down reinforcements from Aleppo could mean trouble. If Islamists take Hama city, the government would be in a dire situation, because it would cut off the whole Aleppo province and relief the Rastan pocket. There may be big plans, but the rivalries and resulting infighting between the various Islamist groups will impede any concerted offensive. The Ahrar Al-Sham Shura council in Idlib just voted against a merger with Jabhat Fateh al-Sham. There are hundreds of local militias who nominally belong to one of the bigger groups but act independently and pursue their own agenda. An agenda which consists primarily of making money by extortion, looting, smuggling, and kidnapping for ransom. Aleppo is done, but my initial relief and gratification has been replaced by a profound sadness. This is a terrible tragedy, this is suffering on an unimaginable scale. Aleppo was a world heritage site, a cultural jewel of the Middle East, a document of tolerance as Muslims and Christians, Kurds and Arabs, Sunni and Shia lived peacefully side by side. All this is destroyed now and Aleppo is in ruins, while the Western propaganda machine still tries to make hay out of the suffering, pushing for more war. I could rebut, dismiss, prove wrong the mass media narrative with detailed arguments and explanations and maybe I will do it one day in a separate blog post if I have enough time. But it will not be authoritative and not definitive. I never visited Syria, in al likelihood most of the blog readers never went to Syria, most of the newscasters, analysts, Middle Eastern experts are not based in Syria and if they are, chances are slim that they will be right at the scene of atrocities and other momentous events to give first hand testimony and make indisputable judgements. We all depend on hearsay, on the testimony of people who most times are not neutral, who have a bias, who want to convince us to support their cause. From the Houla massacre to the Eastern Ghouta gas attack to suicide terror bombings, beheadings, summarily executions, bombing of hospitals and burning of trucks and buses, there are claims and counter claims in every case. Some of the evidence is clearly fabricated and manipulated, often in an amateurish way (like the Caesar photos), some is ludicrous, even comical (White Helmets mannequin contest). Twitter girl Bana Alabed is impressive, touching, but Bana’s father Ghassan is one of the militant Islamists (beside working in the local council), there are several pictures of him posing with an AK47. What else would one expect from the tweets of his wife and his daughter than a damning condemnation of the Syrian government? The Alabed family tweets about hardship, death, and destruction are real, though. The fighting is real, as real as Mexico’s and the Philippines’ war against drug cartels, Britain’s war against the IRA, Russia’s war against Chechen separatists, Sri Lanka’s war against the Tamil Tigers, Turkeys war against the Kurds, Iraq’s Mosul offensive. Aleppo is about establishing state authority over a part of territory which was captured by unlawful armed groups. As the groups were heavily armed and massively supported by other states, the fighting was severe and bloody. If the Black Panthers would have been as well armed as the Syrian jihadis, Oakland would have looked like Aleppo. I could rebut, dismiss, prove wrong all mass media allegations in lengthy elaborations. There are enough contradictions, aberrations, paradoxes in the media claims to atomize the Western narrative. I cannot rule out that inmates die in Syrian prisons from neglect or mistreatment and that civilians are arbitrarily killed by security forces. Inmates die in US prisons all the time and some 1,400 people (mostly black) are killed by US police every year, so why should the Syrian authorities be any better, especially after six years of a merciless war? There are clearly dangerous psychopaths among all parties and many of them cannot even be blamed because the horrors of war can break even the most noble and ethical person and turn him (or her, though this is less likely) into a monstrous mass murderer. Yet, after following the developments in Syria now for six years, I’m confident to say, that the most reasonable and humane actor in this tragedy is Dr. Bashar al-Assad and his inner circle. The countless amnesties, reconciliation efforts, ceasefires, evacuation deals, the efforts to keep up basic public services even in Islamist controlled territory, all this is proof of the tireless efforts to aleviate human suffering and avoid bloodshed. Judging by the televised interviews one has to admit, that Dr. Assad’s personality has hardened over time, the strain and burden caused by this cruel war has taken its toll. One would hope that he is more open to Kurdish aspirations of regional autonomy and a federal system. Russia supports such a solution but Dr. Assad is not yet ready for this idea. That the government orders YPG forces to leave Aleppo city is a bad move. Why can’t the YPG be integrated in the defense of Aleppo? The question, why humans wage war, betray, enslave, persecute, fight and kill their fellow humans, has to be left open and discussed another day. This world never was a nice place and as I wrote before, the Garden of Eden is a religious myth and probably never existed at anytime anywhere, except maybe on some remote Polynesian islands. To talk it out and compromise, to stop producing weapons and sending weapons into war zones, to isolate and quarantine the unredeemable criminals and religious fanatics, to build a just, equitable, harmonious society based on tolerance, cooperation, sharing, empathy should be the order of the day. But who am I to propose this? And the brightest minds on this planet are too busy with developing more and more deadly weapons to even think about ways to achieve peace and social justice.